Your company’s licensed modules are listed under each category. Some modules are actually integrated within the core or basic modules, for example, the Advanced Allocations module will appear embedded within the standard General Ledger module. Asset Management for Epicor ERP your assets are the resources owned by your company which have value and can be sold for cash. With this module you can create, organize, and define asset depreciation parameters. Various depreciation methods and conventions are available, including user-defined formulas that calculate depreciation through a method specifically targeted to your business and legal requirements. With the Fixed Asset Mass Changes utility, you can modify characteristics for a group of assets. Three key programs are available to help you record activities relating to your assets. They are: Asset Addition Entry, Asset Disposal Entry, and Asset Impairment Entry. Each activity is a separate transaction type. The Asset Management module supports multi-currency for asset addition transactions. Asset purchases are recorded in the transactional currency of the Accounts Payable invoice, in addition to the company and reporting currencies. The company currency is used for miscellaneous and transfer additions from inventory. After you enter and post asset activities, view activity details in the Asset Tracker. The Asset Tracker displays transactions and the associated cost and status summaries. Using this information, your company can accurately calculate and report asset costs. Finally, Asset Management provides tools for financial reporting. The Asset Overview Report tracks the status of your fixed assets and their depreciation, addition, disposal, and cost information. You can print physical labels for assets using the Asset Labels Report. To report on depreciation for an asset during a fiscal year and period time range, view the Asset Depreciation Report. Accounts Receivable perform billing based on the parameters defined in customer records, the pricing system, and invoice records to calculate how much your company charges customers. It is also used to receive customer payments, track sales information both internal and external trends, provide credit hold functionality against the customer base, and track current outstanding debts owed to your company. Billing information is setup in two utilities: Payment Terms Maintenance and Customer Maintenance. Payment Terms Maintenance are used to define the various pay agreements you have with your customers. Customer Maintenance defines the billing parameters specific to each customer, like billing address, discount percentages, salespeople and other details. Accounts Receivable Entry is where billing and pricing information comes together. Together Epicor Erp will determine how much to charge your customers based on the quantity ordered and the agreed upon price. When you receive payment from you customer, you will apply the cash received using the Cash Receipts utility found in the Accounts Receivable module. Accounts Payable uses billing parameters defined on supplier records and AP invoices to calculate how much your company owes suppliers. You set up billing information through two maintenance programs – Purchase Terms Maintenance and Supplier Maintenance. Use Purchase Terms Maintenance to define the various pay agreements you have with your suppliers. Supplier Maintenance defines the billing parameters specific to each supplier, like sales tax, payment terms, AP accounts, and other details. AP Invoice Entry is where you record an accounts payable invoice received from a supplier. Before you enter the AP invoice, you should confirm the unit price and the quantity invoice are both correct. Once you have been informed these are correct then proceed with AP invoice entry. Epicor ERP allows you to create logged AP invoices you save within an expense account for accrual purposes. These invoices stay in this account until approved and paid. You can also track payment instruments you need to apply to supplier invoices at a later date. Use this functionality to track and credit control promissory notes, post dated checks, and other future-dated payment instruments. Two key reports can help you review your payments. The AP Aged Payables Report displays open AP invoices by sorting them into aging columns. The Received Not Invoiced Report displays shipments sent to you, but you currently have not yet created invoices for these shipments. Cash Management is for managing and creating both banking and cash accounts. Cash Management includes setup programs used to define bank accounts and bank fees associated with cash receipts, cash payments, bank statements, and bank adjustments. Bank Branch Code Maintenance defines codes used to group bank accounts. Bank Account Maintenance identifies bank accounts and defines their routing information, payment methods, and posting accounts. Finally, Bank Fee Maintenance defines the tax and accounting results of bank fees. You also use Cash Management programs to manage bank accounts and the company’s general ledger cash accounts. Bank Adjustment Entry adjusts bank account amounts and enters bank fees. Bank Funds Transfer transfers amounts between bank accounts. Bank Statement Processing reconciles a bank balance with cash balances in the company’s books. To help you manage these accounts, generate the reports in this module so you can review the information you need. The Payment Proposal report displays the AP invoices that must be paid up to a selected due date. The Check Register report displays all the checks created during a selected period. This report includes all regular checks, manual checks, voided checks, and electronic payments. Deferred Revenue Accounting recognizes deferred revenue based on user-defined amortization codes. Deferred revenue stems from the accounting concept of revenue recognition, under which revenues are recognized only when the earnings process is complete. If funds are received and no goods or services were provided, the process is incomplete and revenue cannot be recognized. In this case, a deferred revenue liability is recorded. Specifically, the deferred revenue account is credited and cash, or other assets, are debited. The deferred revenue utility is flexible and allows you to update posted deferred revenue invoices, simultaneously place multiple amortization periods on hold, and easily and accurately recognize revenue for your company. Deferred revenue can be enabled for a customer, product group, service contract, and Accounts Receivable invoice line. Reports in the module offer various views of revenue recognition and amortization details. The DRA Forecast Report displays a forecast of revenue that will be recognized in future amortization periods. The DRA Reconciliation Report provides the data to review discrepancies between revenue that should be posted on a specified date and the actual date when revenue is recognized. The report details are sorted by GL account. General Ledger is the central financial data capture point that defines the structure of the business from an accounting, organizational, and time based viewpoint. Programs in the General Ledger module set up the application’s posting processes and manage the accounting cycle. The Multi-Site module contains consolidation programs to merge the financial results of subsidiary companies into one consolidated book within the parent company. There are many GL utilities to use when performing routine tasks. You can use Journal Entry to manually enter journals you later post to the general ledger. The Review Journal previews journal results, displays journal errors and contains tools for correcting these errors. The GL Currency Revaluation Process revalues currency segments in a chart of accounts to the values you need in a different currency. You can use GL Transaction Matching to match debit and credit movement against a GL account. 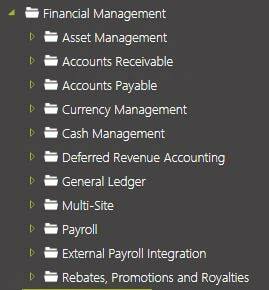 You can create multiple books to record your organization’s financial transactions. You can create a standard, or main book, to record the financial activity of the company. You can also create local statutory and consolidation books; these books regulate the transfer of consolidation journals between two standard books. You use consolidation-related programs to set up and manage the consolidation process. You use Consolidate to Parent Entry to run a consolidation. Other programs are also available to help you set up and manage the consolidation process. Lastly, General Ledger provides tools for financial reporting. Various balancing methods are available, like daily, periodic, summary, trial, carry-forward, and currency balances. The General Ledger Report displays financial information based on journal details using period and summary balances. The Journal Listing Report lists journal entry details. The Consolidation Report program generates a report where you can review consolidation journals prior to posting them. By leveraging the functionality available within the General Ledger module, you can ensure your financial data is accurate and up-to-date. The Advanced Allocations utility distributes specific amounts posted to the general ledger across various receiving, or target, accounts. It is here you define a series of allocations that first pulls amounts from financial source data and then spreads these allocated amounts across multiple target accounts. You set up allocation criteria through Allocation Codes. An allocation code contains a set of parameters for source data (either from accounts or transactions) and then allocation ratios and other parameters that define how amounts will automatically divide across multiple target accounts. Allocations can be divided from a fixed total source amount or from a calculated amount generated through a formula. You can also specify target accounts in external companies available through the multi-company process. You can run the allocation process whenever you need. You can also set it up to run on an automatically recurring schedule. By specifically defining the calculating and processing of allocations, you save time and ensure allocations are consistently dispersed across your selected target accounts.